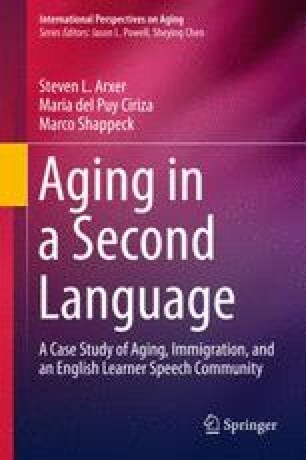 Chapter 2 introduces our Dallas area case study of Hispanic older adult English second language learners. Our 4-year case study data of an English second language literacy program reveals the relevance of place and safe language socialization in mediating the acculturation process. Our analysis draws upon focus group interviews and participant observations with a core sample of 40 Hispanic older adult ESL students. Participants were recruited through a face-to-face announcement in our ESL family literacy program located in a predominantly Hispanic community in Dallas, Texas. Our longitudinal data set allows us to explore a wide range of issues associated with the complex and transitional nature of older adult immigrant second language socialization. We utilize a qualitative, active interviewing approach that has the advantage of producing insights about meanings, contexts, and processes related to older adult immigrants’ unique experiences and their efforts toward language resocialization.